You can use the direct cooking method if you wish but it's usually hard work, due to the high fat content of the sausage meat. 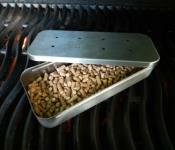 If your barbecue has a lid, why not try the indirect method and smoke them with a few woodchips. Traditional west-country farmhouse food, the hogs pudding is a delicious oversize white sausage, usually sliced and fried for breakfast. 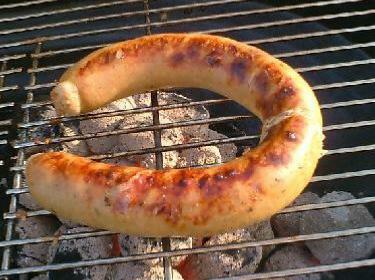 Made from around 70% pork and seasoned accordingly, depending on if its a Cornish or Devonian variety. Its always a good idea to try a local dish wherever you are, it rarely disappoints. Cooking time is approximately 20 minutes when cooking indirectly. Finish over the coals and grill to add more colour and BBQ favour. Old recipes contain a list of unmentionable parts of a pig but modern versions can be purchased at your local West-country food market. Just in case you need to know? the old recipes for Hogs pudding listed: pigs heart, liver and lungs.